If you have a great idea and want to share it with us, please send your suggestion here to be considered by the development team. There is no guarantee that your idea will be adopted or not. But please feel free to perform or propose changes. This wishlist will be a guide to learn about what staff expect to see in future releases. After this is done at our roadmap we will move to the area of approved items. Join, its contribution is very important to us. The Team ImpressCMS ps: If any English speaker can correct this text please. Where to send the Wish? 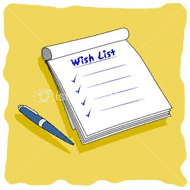 It is important before you send your Wish in our forum in the community. There may be discussed his idea and it certainly will cause a feedback on this wish. I can vote for a Wish? Yes, if you liked an idea or wish, you must edit the industry that wish to include a comment from a small line and add your signature within this Wish. Thus the developer community will know that this Wish is shared by many other people or employees. In general it tends to be an incentive for the development team prioritize any area in particular the development to fit into our roadmap.